This is the third in a series on unconventional propositions about last days and the resurrection of the dead. The first was on that of the Russian mathematician, Andrej Grib, dealing with quantum logic; the second on that of the American physicist, Frank Tipler, dealing with his physics derived Omega Point; this, the third, on the Omega Point as a goal in evolution, devised by the French Jesuit paleontologist, Teilhard de Chardin. With respect to the first two — Grib and Tipler — I want to emphasize that although I find parts of these propositions appealing, I disagree with what they say about last days and the resurrection of the dead. They are not consistent with Catholic Teaching. Nevertheless, we can sometimes learn more about the truth by showing what is false, and it was in that spirit that I posted those two articles: to highlight what Catholic teaching tells us about last days and the resurrection of the dead. Teilhard de Chardin’s thesis is one more difficult to summarize and encapsulate in a short article. He has fan clubs pro and con; there have been books and articles (including those by Popes) extolling his work, and those by eminent theologians consigning it to an ash-heap. I will try to summarize the essential points and to point the reader to online sources (for and against) that delve more deeply. The implication here is that secularization, the loss of religious values, comes about because science is separated from religion. Accordingly, de Chardin’s project was to bring them together again. 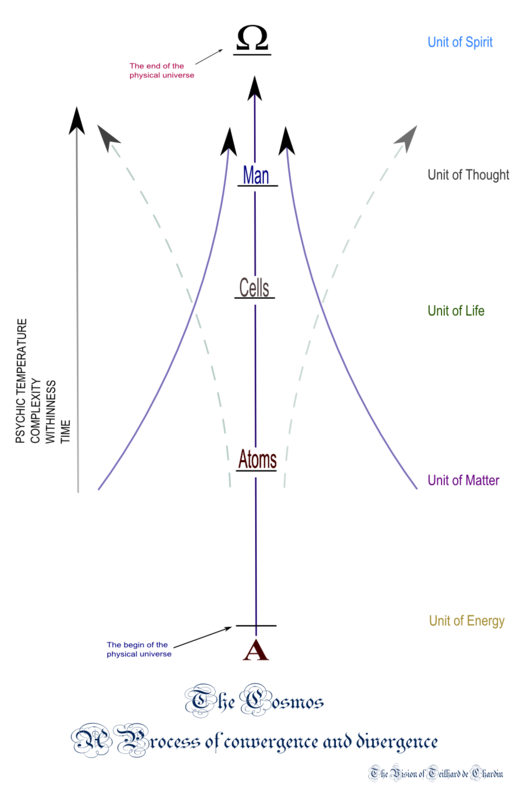 Thus there are stages in this continuous development, in the evolution of the cosmos, as listed in the figure above: matter–> life–> thought –> spirit, or atoms –> cells –> man –> Omega Point (Christ). At the Omega point all will coalesce and, as near as I understand de Chardin, there will be a super consciousness into which individuals are subsumed. 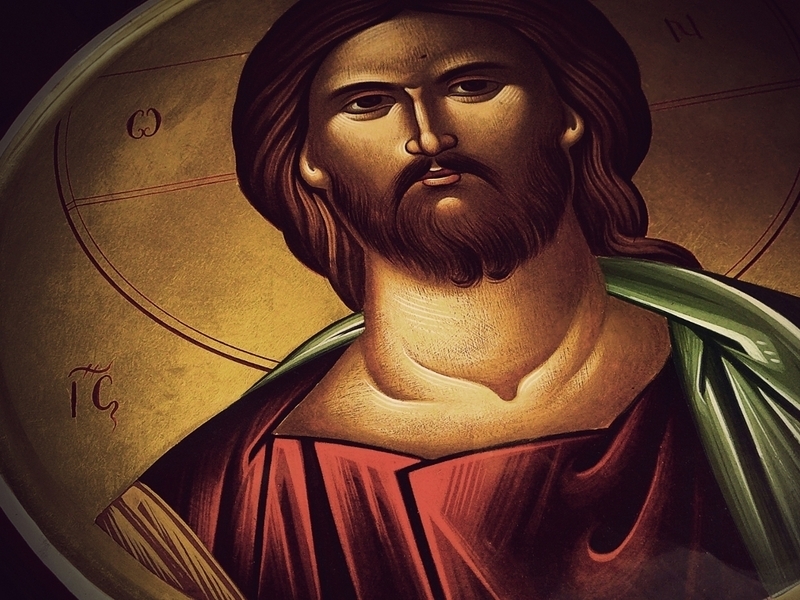 The Christ of Teilhard’s Omega Point is more than Christ the Word, who as God created all things, and Jesus, the man who suffered and died to save us. He is “Christ-the-Evolver”. “[He is identified] not with the ordinating principle of the stable Greek kosmos [the Logos], but with the neo-Logos of modern philosophy, the evolutive principle of a universe in movement.” op. cit, p. 181. In the above I have not commented on de Chardin’s views on resurrection of the dead. Near as I can tell from his works and commentaries on them he supposes that we are immortal (as a soul) and will be subsumed into the Omega Point at the end. This is not the view given in Catholic teaching: both body and soul will be resurrected and we will be resurrected as individuals, not as components of a super-being. With respect to other parts of de Chardin’s Christology and theology, I can only say it is like the curate’s egg: there are some excellent parts and parts which are BAAD! I’ll leave it to the reader (after he/she goes through the references linked below) to decide which is which. Early in his career de Chardin ran into problems with Church authorities because of his novel views on evolution and the Dogma of Original Sin. I won’t discuss this matter here (it’s worth at least two posts) but link to the following reference: Evolution and Original Sin: the Problem of Evil (written by Jesuit priests and seminarians). Orthodoxy of Teilhard de Chardin, Part V.
Will the Vatican let Teilhard de Chardin save the Church? In the above there are quotes from Pope-emeritus Benedict XVI, writing as Joseph Ratzinger, extolling de Chardin’s new views on Christology. In addition, prominent theologians, such as Henri, Cardinal du Lubac, have praised his work.